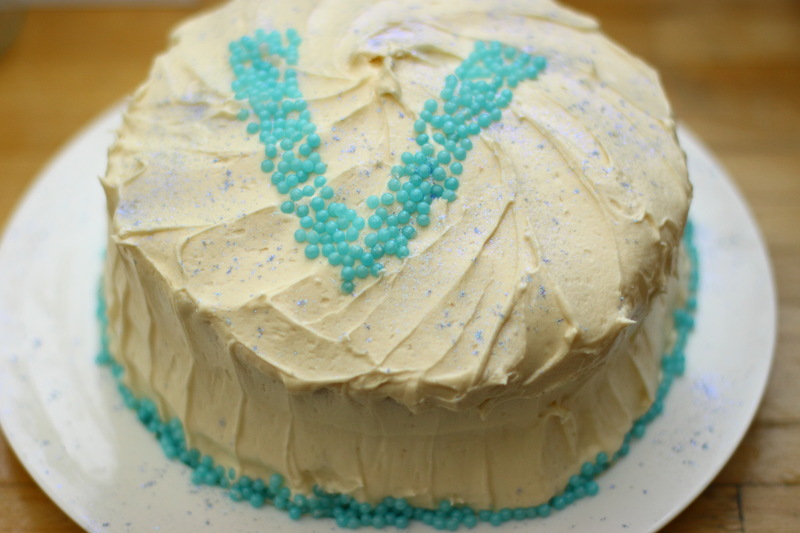 It was Uncle Vernon’s birthday at the weekend so I decided to make him a cake. When you’re 9 months old, it’s got to be a really easy one and this one is simple. Mum wanted to help with icing it so I let her, but regretted it immediately when I saw the mess she’d made of it (it started to sag around the edges after a while). Still though she did her best, so as a reward I let her lick the spoon…. Mix all the dry ingredients together until it resembles a sandy mixture. Separately mix all the wet ingredients and add to the dry. Mix both together until it becomes a smooth batter. Pour into 3 x 8 inch lined cake tins. Bake for 20-25 mins at 180 C.
For the frosting – mix all the ingredients together and beat with an electric whisk for 5 minutes until light and fluffy. Use to sandwich the layers together and ice the top and sides. Have to confess i’ve never made a cake before but my 4 year old saw molly’s blog and said, “let’s make that one mummy.” Thankfully he thinks our creation is the best cake ever, but the reality is it’s like dough in the middle and i’m not too sure how many mistakes i made along the way. The obvious one was running out of baking powder-only had 1 1/2 tbsp-but my other questions are about the method; does “mix” mean with a spoon or machine, should butter be melted first and did we need to sift flour or just add it? Bit of a learning curve but 4 year old already offered our elderly neighbour the next cake he makes so the pressure’s on to get it right! Well done molly though! Laura – Delighted you had a go at the cake 🙂 Sorry the instructions weren’t up to scratch! So – for the dry ingredients, I usually get my hands in the mix and rub the butter into the flour and the baking powder until it looks like breadcrumbs. Then I stir in the rest of the dry ingredients using a spoon or my hands. For the wet ingredients I use a hand whisk or a fork. Then to mix wet and dry together I use an electric hand mixer very briefly until the mixture comes together. The butter doesn’t need to be melted – if it’s soft (i.e. leave it out of the fridge for a while) then that helps to rub it into the flour. All recipes tell you to sift flour. I am not a baker (I dabble but am not very good) and I never sift flour. It’s never made my cakes taste any better / worse than they would have been if I had sifted it. Elaine 🙂 PS – love the fact that your little one is involved – it’s great that he’s enjoying it!